Culturelle® Digestive Health Probiotic - 80 Capsules SALE! Why choose a good bacteria when you can choose a great one? bacteria, backed by over 25 years of scientific research. Lactobacillus acidophilus. Lactobacillus bulgaricus. Bifidobacterium bifidum – they all have big names, but not all probiotic strains have big impact. 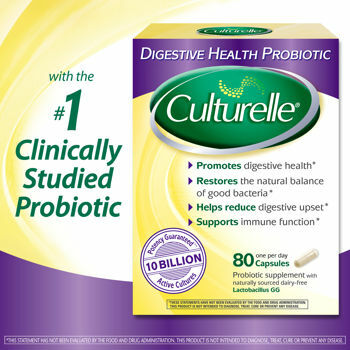 Culturelle is the only brand in the United States to feature 100% Lactobacillus GG, one of the most clinically studied probiotic. It's proven to survive those good bacteria-gobbling stomach acids and successfully stick to the intestinal walls where it's needed most. Many brands list the number of live cells at time of manufacture, not the number at the time of USE. Many products are also not manufactured or packaged in ways that insure you will receive any live bacteria when you take it. Compare that to Culturelle, which guarantees at least 10 billion live cells at the time of use! In fact, each of our capsules is individually double-foil-protected and packed in such a way to keep out light, moisture, heat and air to assure stability and maximum potency. Just one capsule of Culturelle contains significantly more good bacteria than regular yogurt. Culturelle® Probiotic capsules guarantees a minimum of 10 billion live cells of Lactobacillus Rhamnosus GG (LGG) at time of consumption through the date on the box. In regards to regular yogurt, there are currently no regulations regarding the specific probiotic strains used, their probiotic value or their potency. Thus there is no guarantee that a yogurt will deliver a certain amount of beneficial probiotic that would have a positive effect on the body. Our bodies are filled with bacteria - billions, maybe trillions of them. Some are good. Others are not. Under normal circumstances, your body maintains a healthy balance of good and bad. Trouble can arise when the bad bacteria overpower good bacteria, potentially compromising digestion and your immune system. You know the feeling: occasional bloating, poor digestion, irregularity, occasional diarrhea. That's when the power of probiotics can help. For children 1 year or older, take one (1) capsule daily. Capsule may be opened and mixed into cool drink or food. Do not add to warm or hot foods or beverages. Consult your medical professionals for more information. Keep Culturelle in a cool, dry place away from direct sunlight. Keep Culturelle at room temperature or below. 1. What exactly are probiotics? Quite simply, probiotics are the good bacteria found in your digestive tract. Taking a probiotic supplement like Culturelle helps to maintain the natural balance of good and bad bacteria in your body. When good bacteria are added and allowed to multiply, they help replace the bad bacteria – boosting overall digestive health, supporting the immune system and contributing to better overall health. Since there are many different bacterial strains, it’s important to understand that not all probiotics deliver the same health benefits. 2. Can Culturelle really improve my health? Believe it or not, 70% of your body’s entire immune system is in your digestive tract. With your digestive system and immune system so linked, it’s easy to see how optimal health starts in the core. So when the bad bacteria in your body multiply (from causes like diet, travel, stress and certain medications), your digestion and immune system are vulnerable. Fortunately, there’s Culturelle – shown to boost digestive health and support immune health. 3. Does Culturelle help with regularity, diarrhea and other digestive health issues? Digestive issues occur when there is an imbalance of good and bad bacteria. By adding good bacteria (from a probiotic like Culturelle) back to your body and restoring a healthier bacteria ratio, your digestive system can get back on track. 4. What is Lactobacillus GG? Found in Culturelle, Lactobacillus GG is the most clinically studied strain of probiotic for digestive, immune and overall health. Discovered in 1985 at Tufts University in Boston, MA and is considered the premier probiotic in the world. Lactobacillus GG is strong enough and sticky enough to survive stomach acids and successfully colonize in the intestines. 5. Is Lactobacillus GG Safe? Lactobacillus GG is naturally sourced and has been studied intensely in over 700 scientific studies to determine its safety and effectiveness. 6. Of all the probiotics, why choose Culturelle? In study after study, Lactobacillus GG has been shown to survive stomach acid and form a stronger barrier against bad bacteria better than almost all other probiotics. Unlike many of its competitors, Culturelle delivers the optimal number of live, active cells recommended by medical research – in each capsule. Culturelle’s unique properties, state-of-the-art manufacturing and advanced packaging process ensure the greatest amount of active bacteria make it to the intestines – where it matters most. 7. How does Culturelle compare to yogurt? Most yogurts contain just a fraction of Culturelle’s 10 billion good bacteria cells. And most yogurts don’t contain a strain as hardy and beneficial as Lactobacillus GG. And unlike yogurt, Culturelle doesn't have all that extra sugar and calories. 8. Is wrapping every capsule in double-foil really necessary? Culturelle capsules are individually double-foil-protected and packaged in a way to prevent moisture, light, heat and air from getting to the Lactobacillus GG, guaranteeing maximum potency and stability – ensuring you get Culturelle’s optimal benefits. 9. When and how should it be taken? Culturelle can be taken with or without food at any time throughout the day. If you prefer, open the capsule and mix the contents with any cool food or beverage. Culturelle's benefits may be felt within just 48 hours of taking it. To receive the full Lactobacillus GG advantage, take Culturelle every day to help achieve and maintain optimal core health. 10.What happens if I stop taking Culturelle? When you take Culturelle every day, you help maintain a healthy balance of the good and non-beneficial bacteria in your body - promoting digestive, immune and overall health. If you stop taking it, your body loses its Lactobacillus GG advantage in about one week…leaving you more vulnerable to non-beneficial bacteria from common sources like diet, travel, stress and the effects of certain medications. That's why we recommend a daily dose of Culturelle for optimal health. On rare occasions, you may experience mild bloating, gas or digestive gurgling when you first begin taking Culturelle. No need to worry - this is normal due to the changing environment in the digestive system and should go away within a few days. 12. Can Culturelle be taken with other supplements and medications? Culturelle is clinically proven to be safe and effective. It has no known drug interactions and safely coincides with consumption of other supplements and medications, including antibiotics. However, as with all supplements, we suggest you discuss the use of Culturelle with your health care professional. 13. Can children take Culturelle? Yes! Culturelle is especially ideal for children 1 year and above and their still-developing immune systems. Culturelle has been proven to help support children's natural defense systems and reduce digestive upset. Culturelle helps maintain healthy bacterial balance. But is it safe, you wonder? Lactobacillus GG, found in Culturelle, is the most clinically studied probiotic. 14. How do I store Culturelle? Unlike yogurt and other probiotic brands, Culturelle comes to you specially packaged - each capsule is individually double-foil-protected and packed in such a way to keep light, moisture, heat and air out - so it can be stored at room temperature or below. Keep Culturelle in a cool, dry place away from direct sunlight. 15. How can Culturelle help me when I'm travelling? It's disturbing but true: 30-50 percent of people who travel to certain places develop digestive issues. So, why not help protect yourself before your next vacation? By taking Culturelle before and during your trip, you can build up a healthy supply of good bacteria and help reduce stomach and digestive discomfort***.